The price-to-earnings ratio (or p/e ratio for short) is the most popular way to measure the relative valuation of two stocks. It tells the investor how much Wall Street is willing to pay for $1 of earnings. A $10 stock with $1 EPS (earnings per share) is going to have a P/E of 10 ($10 stock price divided by $1 EPS = 10 p/e). You can also invert this financial ratio to calculate something known as the earnings yield. This will allow you to compare shares of a company to other investments such as bonds or real estate. 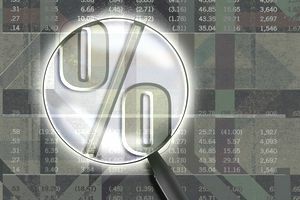 The earnings yield is calculated by simply dividing 1 by the p/e ratio – in this case, 1/10 = 0.10, or 10%. A stock with a 10 p/e is going to have a 10% earnings yield. That might be very attractive if bonds are yielding only 4%. (For more information on using this as an indicator of overvalued or undervalued stock markets, read Long Term Treasury Bond Yields vs Earnings Yields - Using the Risk Premium as a Quick and Dirty Gauge of Market Valuations. One of the limitations of the p/e ratio is that it doesn’t factor in growth in underlying earnings. Back when Sam Walton was rolling Wal-Mart stores throughout the United States, his customers could have told you that the cookie-cutter formula was going to continue to be rolled out throughout the nation. The gains in annual profit from year-to-year were eye-popping. The result? An astronomical p/e ratio. Still, when factoring in future growth, Wal-Mart was one of the cheapest stocks available on a value basis because the future cash flows more than justified that level of valuation – after all $10,000 invested back during the IPO with dividends reinvested is now worth north of $10,000,000 and throws off at least $170,000 in cash dividends each year. There is a way to adjust for the shortcomings of the p/e ratio and it’s called the PEG ratio. It stands for the price-to-earnings-to-growth ratio. To calculate the PEG ratio simply take the p/e ratio and divide the growth in earnings per share. Imagine that we have two companies – Company ABC and Company XYZ. The first, Company ABC, trades at $20 per share and has $1.50 in per share earnings with conservatively estimated future growth of 3% per annum. The second, Company XYZ, trades at $60 per share, has $4 in per share earnings and has conservatively estimated future growth of 5% per annum. Which stock is the cheaper one? In this case, Company XYZ appears cheaper at $60 per share than Company ABC does at $20 per share despite having a higher p/e ratio as a result of the future growth in earnings. The guideline to use is that the lower the PEG ratio, the cheaper the stock. The biggest danger in the PEG ratio is approach is that humans are naturally optimistic. By banking too much on the promise of the future, a stock that would otherwise be worthless might appear to be a great bargain. This is what you had in the days of the dot-com bubble. Everyone was convinced that each new Internet business that went public would become the next Microsoft or Cisco. The difference: Both of those companies had very real earning, and very real earnings growth. There were rumors years ago that Warren Buffett was once reviewing projections for future growth at Blockbuster. After looking at the figures, he mentioned that if you thought rationally about the assumed growth rate, every man, woman, and child would need to rent two videos per day, 365 days per year to make those estimates come to fruition. That isn’t going to happen. You need to frame your growth assumptions in this same way – ask yourself the underlying implications. This mental discipline can protect you from the downside of the PEG ratio, while still letting you take advantage of its basic premise. What about hugely profitable, blue chip stocks that pay out a lot of their earnings as cash dividends? The PEG ratio wouldn't work as a substitute for the price-to-earnings ratio when dealing with this sort of situation. To get around it, there is another formula known as the dividend adjusted PEG ratio, which we explain how to calculate here.